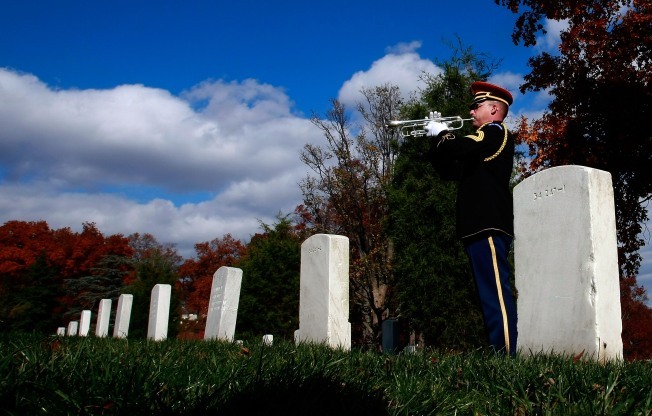 A bugler plays "Taps" during an commemoration at the site of General John Pershing's grave Arlington National Cemetery November 10, 2008 in Arlington, Virginia. The event, featuring soldiers in World War I uniforms honored 116,516 Americans killed in the First World War a day before Veteran's Day and also on the 90th anniversary of the armistice ending World War I.
Closure has been a long time coming for one military family. The Department of Defense announced Wednesday that the remains of a soldier -- missing in action since World War I -- have been identified and returned to his family for burial with full military honors. Army Private Thomas D. Costello of New York, N.Y., will be buried on July 12 at Arlington National Cemetery. On Sept. 16, 1918, as part of the 60th Infantry Regiment, 1st Brigade, 5th Infantry Division, Costello encountered heavy enemy artillery barrage and machine gun fire near Jaulny, France, in a wooded area known as Bois de Bonvaux, Army officials said. He was killed during the battle and his remains were buried with two other soldiers in a wooded area between Bois de Bonvaux and Bois de Grand Fontaine. Unfortunately, efforts to find and retrieve Costello’s remains by Army officials after the war were unsuccessful. But in September 2006, French nationals hunting for metal in the area found human remains and World War I artifacts, officials said. Later, a Joint POW/MIA Accounting Command team, operating near the location, was notified of the discovery and recovered human remains upon excavating the site. Among other forensic identification tools and circumstantial evidence, scientists from the JPAC laboratory also used dental comparisons in the identification of the remains. The Army contact Costello's next of kin, Michael Frisbie, 43, who had no idea he even had a great-great uncle in the "Great War." "He was on my father's side of the family, which I didn't know very well," Frisbie told NBCNewYork, when contacted by telephone in Stockton Springs Maine. He said his parents divorced when he was only six months old, and didn't know much about his paternal relatives. But that didn't lessen Frisbie's reverence for the man who died for his country. "Of course, I never knew him personally but It's a whole respect thing -- he's a soldier, he's a soldier of the United States," said Frisbie, who is now in possession of Rosary beads that were found with Costello's remains in France. "I'm not a religious man, but I have my beliefs," he said. He also noted that his own daughter had just graduated boot camp in the Air Force and would be shipping overseas soon. Frisbie, his wife and their daughter are headed down to Arlington, Va., this weekend to attend the burial. Army officials didn't have an exact date of birth for Private Costello, but said he was 25 years and 4 months old at the time of his enlistment, on September 19, 1917. That means that at the time of his death he was 26 years and 4 months old. Megan Smolenyak, a genealogist who helped work on the Costello case said his draft registration card said he was morn on May 1, 1892. She also noted that Costello was an immigrant, originally born in Ireland. She said the Defense Department's program to recover, identify and return soldiers' remains from all wars was a noble effort. "I think folks would appreciate knowing that 'no man left behind' is more than an expression," Smolenyak told NBCNewYork.